Tackling Youth Substance Abuse (TYSA) is a data-driven collaboration aimed at leveraging the power of collective impact to decrease substance misuse and increase healthy choices for Staten Island’s youth and young adults. This coalition seeks to increase opportunities to access quality prevention, early intervention, treatment, and recovery services on Staten Island to change the dialogue around behavioral health issues. TYSA is a dynamic partnership of private and nonprofit organizations, city and state government agencies, philanthropists, parents, teachers, and young people— many of whom have been working to combat alcohol and drug misuse for years. The TYSA coalition is different because all of its members work together to help one another, and the whole community, prevent substance misuse. 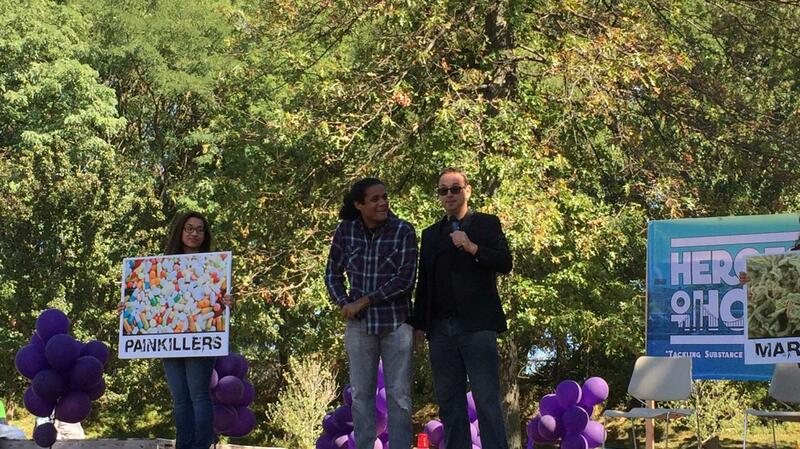 TYSA engages diverse communities and individuals on Staten Island who are playing a part in decreasing youth and young adult substance misuse. TYSA aims for major gains, not minor improvements, in decreasing the use of alcohol and prescription drugs, and in increasing healthy choices among Staten Island youth and young adults. The TYSA coalition does not duplicate existing programs; rather, the partners align efforts to achieve a greater collective impact. How was the TYSA coalition formed and what is its history? 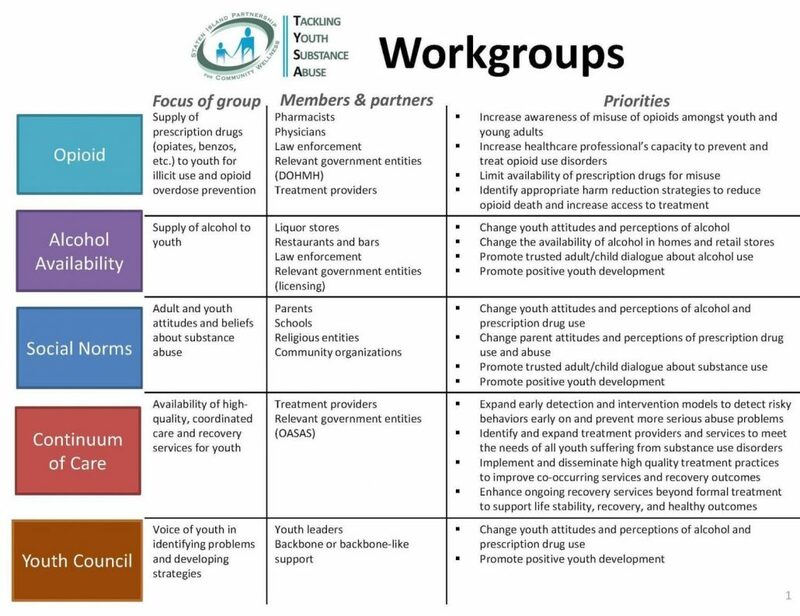 TYSA, known as Tackling Youth Substance Abuse, was founded in 2011 when Take Care Staten Island, The Staten Island Partnership for Community Wellness, and The Staten Island Foundation convened people interested in addressing community health issues. With the assistance of FSG, a global non-profit consulting firm, community members analyzed local health data. Alarming trends showed Staten Island youth were burdened by substance use issues – specifically prescription drug misuse and underage drinking – at a rate much higher than their NYC counterparts. Using the collective impact model, a high-level strategic framework was adopted in November 2011, including a common agenda, problem data, goals, and indicators, as well as a blueprint for implementation. In September of 2012, newly hired staff and community partners formally launched TYSA, through generous funds from The Staten Island Foundation, at a standing-room-only event at Staten Island’s Borough Hall. TYSA is currently supported by grants from the Substance Abuse and Mental Health Services Association (SAMHSA), the NYS Office of Alcohol and Substance Abuse Services (OASAS), the YMCA Counseling Service, The Staten Island Foundation and the countless hours of coalition members and community volunteers. 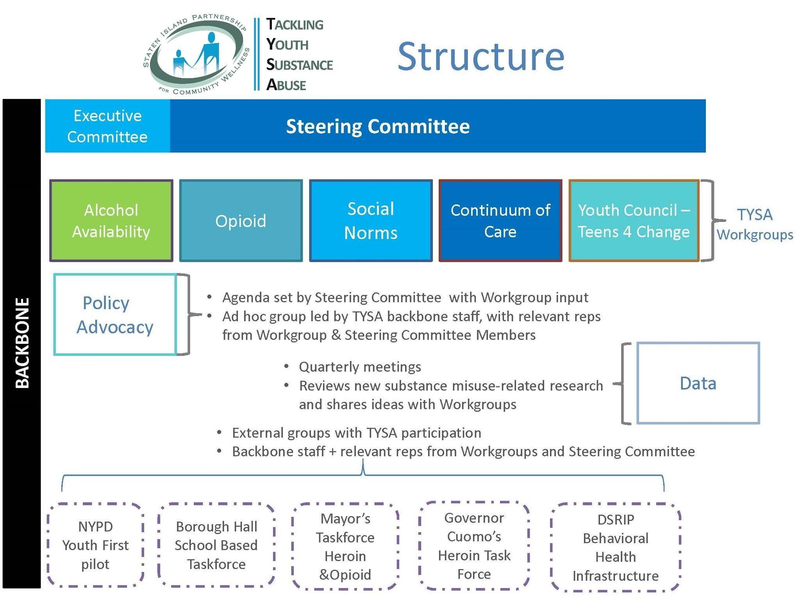 TYSA is led by a robust Steering Committee comprised of individuals from organizations across Staten Island, New York City, and New York State. The Steering Committee ensures that all initiatives of the coalition follow the criteria, including population-level impact, structural change, data-driven tactics and evidence-based strategies. TYSA is supported by backbone staff members from the Staten Island Partnership for Community Wellness. TYSA has five workgroups that report to the Steering Committee and Executive Leadership. The workgroups have specific priorities as mentioned below. TYSA is grateful for all of its partners, each of whom plays an important role tackling substance misuse in our community. 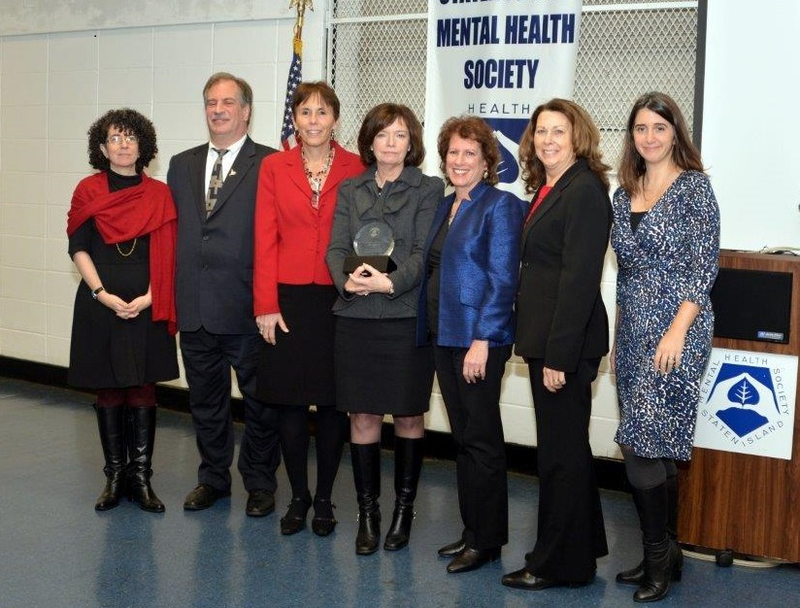 Partners who work together to reduce, treat and prevent substance misuse on Staten Island and throughout New York City. Rather than recreate services, TYSA partners work to fill holes and anticipate trends. We thank every Steering Committee and Workgroup member for their valuable time and expertise.